Early next morning the Venerable Chee Seen took Li Chooi Peng to a training hall. He stretched himself on the floor, his body straight, his head facing downward and his back facing upward, supported only by his toes and his palms. Then he pressed up and down numerous times. Li Chooi Peng followed what her sifu did. Everyday they increased the number of times of pressing up and down gradually. After about a month of daily practice, Chee Seen changed his palms into fists, with his tiger-mouths (i.e. the parts between the thumb and the index finger) facing forward. After another month, he changed his fists into three fingers each hand, using his thumb, his index finger and his middle finger, with his thumb behind. The small girl followed her master. After a few months, Chee Seen, in the same poise, hopped to the front and then to the back, using only his fingers and his toes, and keeping his body straight. The student followed what the master did. After a year, Li Chooi Peng was very forceful in her fingers. The Venerable Chee Seen was very happy. Then he transited to Li Chooi Peng the techniques of attacking, defending, rising, falling, shooting and swallowing. Li Chooi Peng was very intelligent. Once she saw the kungfu movements, she would not forget. Hearing this, Chee Seen laughed loudly. “You’ve asked well. But it is usually difficult to examine the origin of kungfu. Since ancient time, scholars generally do not regard martial art as something that is presented in the grand hall (i.e. not as a topic for serious investigation). Thus they do not spend time and effort to examine and record it. “Although I spent some time to investigate its source,” Chee Seen continued, “what I know is from what I have heard. I have no way to determine the truth. As you have asked, I am glad to tell you. “According to legends, this type of techniques was invented by our First Patriarch Bodhidharma (or Da Mo in Chinese). Bodhidharma arrived at the Shaolin Monastery in Henan, and meditated for nine years in a cave. On day Guan Yin Bodh Satt (the Bodhisattva of Great Compassion) appeared, with millions of lotus flowers. Therefore Bodhidharma attained the truth of Buddhism. “He returned to the Shaolin Monastery to transmit the truth. But in his sermons, whenever he explained sutras, the monks were weak, and some yawned. So our First Patriarch told the monks that although the physical body is not important, before one attains Enlightenment, before his personal spirit merges with the Universal Spirit, he has to strengthen his physical body. Thus, before realizing Nature, it is necessary to be healthy. When the physical body is strong, the spirit can more easily attain the Way. “Bodhidharma said that the monks were weak and sickly. He wanted to teach them an art that could make them strong and healthy, to let them practice daily. So he invented the Eighteen Lohan Hands. This was the beginning of Shaolin Kungfu. “There were many tigers around the Shaolin Monastery which harmed the local people. Bodhidharma often descended the mountain to tame the tigers. One day he caught a baby tiger. He brought the baby tiger back to the monastery and trained it daily. When it grew up, Bodhidharma let it guard the monastery, and named it ‘Night Guard Protecting the Mountain’. From his experience, Bodhidharma invented ‘Piercing Tiger Sword’ and ‘Taming Tiger Fist’. “Oh, I have digressed. This chin-na techniques of Eagle Claw were based on the techniques of dotting energy points (i.e. when energy points were touched in a seemingly gentle manner, an opponent lost his ability to fight further). Bodhidharma transited the techniques generations after generations. In the Sui Dynasty, they were transmitted to the Venerable Lo Choe, and Lo Choe transmitted to Seen Ho, and Seen Ho to Yun Meng. In the Yuan Dynasty, Yong Yeit improved the techniques, and transmitted them to the Kok Yun (pronounced as ‘Jue Yuan’ in Mandarin). “The Venerable Kok Yun was very keen in Shaolin techniques, and learned all he could. He met excellent masters like Li Mong Sau and Pak Yuk Fong (pronounced as ‘Bai Yi Feng” in Mandarin, the First Patriarch of Wuzuquan). Later Li Mong Sau and Pak Yuk Fong became monks at the Shaolin Monastery, and were intimate with the Venerable Kok Yun, practicing kungfu together. Since then, most of martial art secrets came from the Shaolin Monastery. “When chin-na techniques of Eagle Claw were spread to the public outside the monastery walls, they were very popular in Fujian Province. 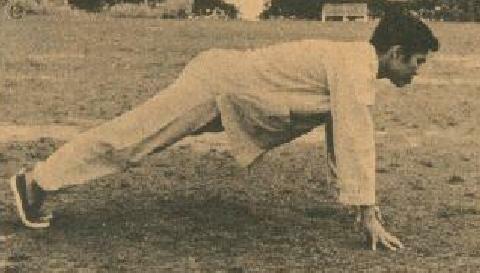 The Venerable Kok Yun further improved the Eagle Claw chin-na techniques. But later martial arts became unpopular, and Eagle Claw chin-na techniques were almost lost, but were maintained in the Shaolin Monastery. During the time of the Ming Dynasty, Li Kheng Chu and Cheong Chong Kai (pronounced as ‘Zhang Zhong Xi’ in Mandarin) learned these techniques, but they rarely transmitted the techniques to other people. Chee Seen continued, “The most important aspect for you is to understand how to apply these techniques in a marvelous way. These chin-na techniques are different from fist techniques, different from staff techniques. Their essence is to use the opponent’s strength in a marvelous way. When you are in combat, if your opponents are stronger than you, don’t match your strength with theirs. “You use their strength to defeat them in a marvelous way. Kungfu focuses much on the use of strength. A person may be strong like a buffalo, but if he does not use strength skillfully, you can defeat him. “Its explanation lies in ‘gaining advantages’ or ‘not gaining advantages’. If you hold sometime and when you gain advantages, you won’t feel difficult even after a hundred miles. If you don’t gain advantages, after a few steps you will be sweating and out of breadth. “Nevertheless, besides using ‘miraculous strength’, an exponent of Eagle Claw chin-na techniques must understand a persons bone structure and energy flow system. A person’s bones and tendons have their definite position. Energy flow also has its definite meridians. Energy flows first, then blood follows. Wherever energy flows to a particular energy point, blood will flow there. This follows a definite system. “If energy flow and blood flow are blocked, or if bones and tendons are out of position, it will affect the whole person. If you understand this explanation, then the application of Eagle Claw chin-na techniques will be clear. “When we subdue an opponent, we do not use our fists, and also do not use our palms. We depend on our thumb, our index finger and our middle finger. There is a difference between yin-hand and yang-hand. When the palm faces skyward, and we move from below upward to meet our opponent, this is yang-hand. When our palm faces the ground, and we move from above downward, it is yin-hand. “Irrespective of whether we use yin-hand or yang-hand, as soon as we are in contact with an opponent, we use our thumb, index finger and middle finger to grip together, like gripping something. In one move, we grip an important part of an opponent’s body, generate our internal force and subdue him. “Hence, in this method the effective result comes from our three fingers. We must train well in the kungfu of the three fingers. Most people use their power on their fists and palms, but it is insufficient to use their power on their fingers. It is because the strength of the fingers is limited. Li Chooi Peng was very happy. She knelt down to thank the advice of her sifu. This entry was posted in Grandmaster Wong Kiew Kit, Kung Fu, kung fu culture, legends, Shaolin, Shaolin Wahnam, stories, strategies and tagged Grandmaster Wong Kiew Kit, Kung Fu, kung fu culture, legends, Shaolin, Shaolin Wahnam, Stories, strategies on May 22, 2018 by Wei Joo Lee.